Out of total geographical area of India, area covered by forests is 24.16 percent. India has been trying to achieve to put 33 per cent of its geographical area under forest. Presently NDA government decided to spend 6.2 billion dollars (Rs. 41,000 cr) to increase India’s forest cover. Among all the states Madhya Pradesh has the largest forest cover in India followed by Arunachal Pradesh, Chhattisgarh, and Odisha. Out of total are covered by forests in India, the maximum share is of Moderate Dense Forests, followed by Open Forests. Lakshadweep Island has zero per cent forest area where as Andaman and Nicobar Islands have 86.93 per cent. 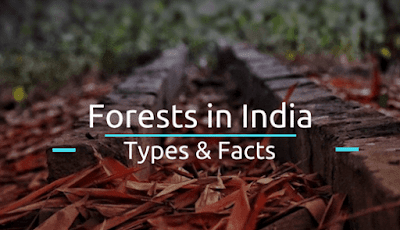 Most of the states with less than 10 per cent of the forest area lie in the north and northwestern part of the country. India is one of the top ten countries in the world in terms of forest area. Russian Federation, Brazil, Canada, United States of America, China, Democratic Republic of the Congo, Australia, Indonesia and Sudan. Together, India and these countries account for 67 percent of total forest area of the world. In India, Protection and conservation of forests is done through implementation of Forest Conservation Act (1980) and by establishment of protected areas. Till 2017, The Government of India has established 597 Protected Areas of which 95 are National Parks and 500 Wild Life Sanctuaries. These 597 protected areas cover 5 per cent of the geographical areas of the country. 21st March is celebrated as International Day of forests. The theme for 2017 is Forests and Energy. It is also known as Monsoon forests. Based on amount of rainfall, these type of forests further divided into moist deciduous forests and dry deciduous forests. Moist deciduous forests found in the northeastern states along the foothills of Himalayas, eastern slopes of the Western Ghats and Odisha. These type of forests found in mountain regions. These type of forests are further divided into northern mountain forests and the southern mountain forests.